Today, I want to share five valuable lessons I learned from my First Sergeant. I was very fortunate to spend two years in Company Command of a Forward Support Company in a Light Infantry Battalion. Not only did I have a great staff and great unit, but I had an amazing First Sergeant. His name was 1SG Bob Wettig and this guy has spent close to 40 years in the Army. We served together my entire 24 months in command. During our two years of working closely together, he taught me many valuable lessons. He had so much experience and maturity to share with me and the rest of the organization. He was like a father figure to me. He was also a close friend and mentor. What I want to do in the paragraphs below is share five valuable lessons that I learned from 1SG Wettig. I hope they help you as much as they helped me. # 1 You Gotta Have Heart! Talent is important. But, if I had to choose between heart and talent, I will pick HEART every single time. You can teach someone a skill, but you can’t teach heart. You either have heart (passion) or you don’t. Sure, my 1SG was talented. He wouldn’t have gotten selected for the job otherwise. But let me tell you something. This guy had more heart that anyone I’ve ever worked with in my entire military career. He loved his job. He loved wearing the uniform. He loved his troops. He loved his unit. He loved his country. All of these things were obvious to everyone, not just me. Because he loved what he did and was so passionate about being a First Sergeant, it showed! My takeaway for this lesson is to tell you that if you want to be successful at something (and in life) you really gotta have heart. Talent alone will only get you so far. If you heart isn’t in it, your soldiers will know. You hear this advice time and time again. Taking care of soldiers has become a buzzword that gets thrown around in the Army a lot! Sadly, a lot of leaders really mess this up. 1SG Wettig was great at taking care of his Soldiers. Every decision he made, and every recommendation he made to me, he had the soldiers’ best interest in mind. It was never about him. He loved his soldiers like a parent loves a child and he wanted them to be successful. As a result, his soldiers were very loyal to him. More importantly, he never thought it was his soldiers’ job to serve him. Instead, he thought it was his job to serve the people on his team. He was a true servant leader. I wish every leader thought this way. No one is good at everything. I’m not and you’re not either. If there is one thing that 1SG Wettig and I did well together, it was communicate and share our strengths and weaknesses with each other. We knew when one of us had to help out the other person and pick up the slack. Because we had an open, heart-to-heart conversation about this (many times) we never had any big issues. The bottom line is to know the strengths and weaknesses of your counterpart, as well as your own. Leverage each other’s strengths so you can work smart, and get the job done. 1SG Wettig had a great attitude. He made sure the mission got done AND he took care of his soldiers. He was optimistic and saw the best in things, and the best in people. Even when times got tough, you seldom heard him complain. Soldiers could look to him for leadership and calmness. It took a lot to rattle his feathers and make him upset. He was calm, confident and poised in just about every situation; just what you look for in a leader. The 1SG and I were handed a few misfits that were passed around from other units. 1SG Wettig really taught me how to see the best in people and give everyone a chance to succeed. We welcomed anyone to our unit and gave them an opportunity to start over fresh. Some made it and others didn’t. I still try to follow this advice in my business and life today! Everyone deserves a second chance. In summary, these are five valuable lessons I learned from my First Sergeant during my two years in Company Command. 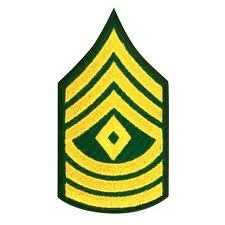 1SG Wettig was my First Sergeant and he did an amazing job with our company. 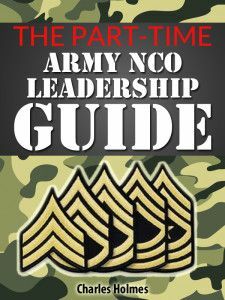 If you are fortunate enough to work closely with a 1SG or senior NCO, learn everything you can from them. They have so much experience and knowledge to share with us young officers. How about you? If you are a former Company Commander I would love to hear some of the valuable lessons you learned from your 1SG during your time in command. Just leave a comment below to share your thoughts. Thanks for reading. Have a great day! Nothing can help keep a unit together like a 1SG. They provide an important role as the main person in the unit that has the individuals best interest in mind. They can be your shoulder to lean on, a sounding board for ideas, and in a worse case scenario- your lawyer. They can protect you from a bad officer, or a bad situation or even yourself. If I was drafting a unit, the 1SG is my number one pick. Same here. A good 1SG really is worth their weight in gold. These are definitely 5 things that a great leader needs. I agree, having HEART is within you and not something you can learn. I guess that’s why I generally cheer for the underdog who makes it to a championship game. It is impossible to be a great leader unless you have a clear vision and remember the people who got you there. To be a mentor and still be humble enough to learn new things and admit when you are wrong or when you do not know something builds strength in character too. Yep, having heart and passion for what you do can take you pretty far in life. Of course, having talent helps. It is very refreshing to hear about great relations between a Commander and their 1st Sergeant. It sounds like you were very fortunate Sgt Wettig their helping you. I just love the part about heart. You are so right; if we don’t have the skills, but we have heart, we can do whatever we set our mind to do. I also like the one about giving all a chance. Sometimes we as humans tend to judge people by their looks, or their past. Everyone needs a chance, or 2 and I believe we all need to provide that opportunity. Great post sir. Working with 1SG Wettig was a true honor. I learned a lot from him, built a great friendship, and became a better leader from the situation.